Slapping a grade on an NFL draft the day after it happens is dumb. Slapping grades on teams in the middle of the draft? Well, that’s even dumber. Everyone knows this, but we still write and read draft-grade articles at any possible time of draft reflection because the idea that a team might have just turned things around with a great draft is incredibly compelling. That’s why this is not a draft-grade article. With one round of the 2012 NFL draft in the books, it’s impossible for us to have much of an idea of how these players are going to turn out. For one, they have plenty of development left before they become finished products, and a lot of that development is going to occur in training camps and across their first couple of seasons. All we can do right now as fans and analysts to try to get an idea of how each team is doing is combine a bit of common sense with our perceptions of value to qualify some of the interesting decisions made by the league’s 32 organizations on Thursday night. And since the draft is about optimism and hope, let’s start this “Five Up, Five Down” piece with a look at five of the more logical decisions made by NFL teams last night. 1. The Jaguars trade up to grab Oklahoma State wideout Justin Blackmon. 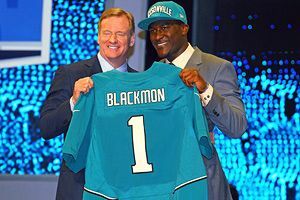 Regardless of what he does at the professional level, Justin Blackmon had more value to the Jacksonville Jaguars on Thursday night and in this upcoming season than he would for any other team in football. For one, even if he struggles as a rookie, Blackmon provides a dramatic upgrade on what had been the least-talented group of wide receivers in the league. The Jaguars started a variety of sub-replacement-level wideouts last year, and even improving to below-average at the position would be a vast improvement. With Blackmon presumably taking over the lead role, his presence will help move the team’s other receivers into more appropriate roles, in which they can be more valuable. Laurent Robinson — useless as a top guy in St. Louis and wildly effective as a third wideout in Dallas — moves out of the presumed no. 1 receiver spot into a supporting role, while Mike Thomas, who was wildly miscast, can serve as a possession receiver and work some out of the slot. The hidden advantage of acquiring Blackmon, though, is why the Jaguars will get more out of their rookie wideout than any other team in football. Yes, it’s clear that making this move gives embattled Jacksonville quarterback Blaine Gabbert another weapon. What it also does is give the decision-makers in the Jacksonville front office a better idea of whether Gabbert is really their quarterback of the future by eliminating an obvious excuse. If Gabbert failed to launch in 2012 and scuffled through a mediocre year, miscreants like ourselves could point out that he had a terrible group of receivers and deserved another shot with a talented young wideout to catch his passes. Now that excuse is off the table. If Gabbert doesn’t improve in 2012, the Jaguars can safely say that Gabbert’s not the guy they should be building around and act accordingly for the 2013 season. In other words, if Gabbert’s not the guy, the Jaguars will know earlier and won’t have to waste an extra season trying to figure out whether he’s their championship-caliber quarterback. And if he is the guy, well, they just got him the top target he needs to push Jacksonville toward the playoffs. It’s well worth the fourth-round pick they gave up to get past the Rams, who would have likely nabbed Blackmon with the sixth pick. 2. The Steelers draft Stanford guard David DeCastro. Outside of Blackmon and the quarterbacks taken with the first two picks on Thursday, there was no better match of team, style, and need in the first round than the Steelers and DeCastro. The Stanford graduate was rumored to be a target for various teams in the middle of the first round, and while he might be one of the five or six best players in the draft, the relative lack of importance placed on guards caused him to fall to Pittsburgh with the 24th pick. What the Steelers get with DeCastro is the next Alan Faneca, a dominant all-around interior lineman who will be a leader on and off the field. The Steelers have struggled over the past several years to replace Faneca, and while they found a keeper two years ago in center Maurkice Pouncey, their offensive line has been the Achilles’ heel of a team that’s above-average or better in every other facet of the game. The combination of Pouncey and DeCastro gives them a strong base on the interior and should improve Pittsburgh’s performance in short yardage going forward. With DeCastro’s ability and Pittsburgh’s proven excellence in developing young talent, there might not be a single player in the draft more likely to make five Pro Bowls than DeCastro. 3. Dallas trades up and grabs LSU cornerback Morris Claiborne. You have to give it to Jerry Jones and the Cowboys; when Dallas has a weakness, they are certainly willing to invest serious resources to fix it. After inconsistent performances from the likes of Mike Jenkins and Terence Newman over the past three years, the Cowboys went and blew up their starting cornerback tandem this offseason. They released Newman, signed Chiefs corner Brandon Carr to a $50.1 million contract, and used a second-round pick as bait to trade up and grab Claiborne with the sixth pick on Thursday. Dallas said afterward that they hadn’t placed a similarly high grade on a cornerback since Deion Sanders, and they were apparently so afraid that other teams would share their interest in the LSU cornerback that they avoided any sort of public or private contact with him before draft day. This seems bizarre to think about in the real world — if you found a house you liked online and wanted to buy it, would you never visit it or talk to the owner before you submitted a bid to the realtor? — but it might have worked for the Cowboys. Now, Dallas should be able to step up and hold their coverage against the likes of the Eagles and Giants, each of whom have multiple above-average receivers to contend with. The question now is what to do with Jenkins. With one year left on his deal and Orlando Scandrick handsomely compensated to play the nickel, the Cowboys seem likely to move Jenkins along to a cornerback-needy team. Such a move could help them recoup the second-round pick they gave up as part of the Claiborne deal. to grab two front-seven guys in the first round? If the Patriots are known for anything on draft day, it’s perpetually moving back in the draft while grabbing extra draft picks; although they’ve traded down a number of times in the first round during the Bill Belichick era, they hadn’t traded up in the first round since the 2003 draft, when they moved up one spot to grab defensive lineman Ty Warren. It was quite shocking, then, to see the Patriots twice move up in the first round on Thursday, trading up both times to grab prospects for their front seven. The first move saw them grab Syracuse end Chandler Jones, who comes from the most athletically gifted family on the planet, since his brothers are Ravens linebacker Arthur and UFC light heavyweight champion Jon. (Yes, they narrowly beat out the Gronkowski trio.) For all that athleticism, though, Chandler Jones had just 10 sacks in 33 games at Syracuse before coming out of school a year early. The better selection may end up being Alabama linebacker Dont’a Hightower, who has the versatility the Patriots crave in their defensive stalwarts. New England used the 4-3 more than the 3-4 last season, but their selections here suggest that a move back to the 3-4 could be in store for 2012 and beyond. 5. The Minnesota Vikings move down one spot and grab USC tackle Matt Kalil. In the middle of a stadium disaster and a losing team that just lost its top star to a devastating knee injury, it would have been easy for the Vikings to try to target an exciting player under the guise of boosting attendance. (We’ll get to the Dolphins later.) What it wouldn’t have done, though, is improve their football team; grabbing Trent Richardson would have been catastrophically naive, and even a move for Blackmon wasn’t a necessity with Percy Harvin’s breakout 2011 season on the books. Instead, they teased the idea of trading down long enough to convince the Browns to give them three draft picks for the privilege of moving up one spot, and then went out and grabbed a possible franchise left tackle in Matt Kalil. The team had a huge hole at left tackle over the past couple of seasons, with and without disinterested veteran Bryant McKinnie, and Kalil should put a stop to that. His presence allows them to keep Phil Loadholt on the right side, and with John Sullivan emerging as a quality center, the Vikings could have an above-average offensive line again for the 2013 season, which is when Adrian Peterson will be back at 100 percent. Even if Kalil struggles at the professional level, the logic behind the move is sound. We can’t exactly say that about these upcoming five decisions. 1. The Browns and Giants grab running backs in the first round. What is it going to take before teams realize that spending money on running backs is a misuse of precious resources? Both these teams have enjoyed success from backs on the cheap over the past couple of seasons, and they both totally ignored that process in targeting running backs in the first round. The Browns might not have had much fun with Peyton Hillis last season, but remember that he looked to be a franchise back in 2010 and only cost Cleveland Brady Quinn, who was a candidate to be released. Did that convince the Browns to go back to the well and try to find the next Peyton Hillis for $500,000? Nope! Instead, they used the third pick on Trent Richardson, who will be spinning his wheels in the backfield next year behind an unimproved offensive line. Of the 14 running backs who have been taken in the top five since 1990, only a handful have delivered on their promise. Most have flashes of brilliance mixed with injuries, which is exactly what you get from guys like Jerome Harrison, who cost nothing. The Giants, meanwhile, can’t even follow their own history. Remember who the Giants had in 2006? Right: Tiki Barber, a big-name, big-money running back. When he retired before the 2007 season, the Giants pieced together a rotation with a fourth-round pick (Brandon Jacobs) and a pair of seventh-rounders (Ahmad Bradshaw and Derrick Ward). Behind a great offensive line, they were a dominant rushing attack and a key part of Big Blue’s Super Bowl run. During the following season, they were even better, with Jacobs and Ward each hitting 1,000 yards. Instead of assuming that the offensive line was the important part of the equation, these running backs all began to get rich. Ward got a big contract in free agency from the Buccaneers and ran for a total of 409 yards before being released. Jacobs got a hefty raise to re-sign with the Giants and immediately saw his performance drop off before he was taken out of the starting lineup and replaced with Bradshaw. What do you think happened to Bradshaw? Why, he got a hefty contract extension last offseason and promptly saw his yards per carry dip below 4.0 for the first time in his career. Bradshaw also struggled with injuries and then nearly fumbled the game away in both the NFC Championship Game and the Super Bowl. How on earth could you follow that pattern and decide that your team needs to invest more in running backs? With their Super Bowl halo, though, the Giants spent the 32nd pick on Virginia Tech running back David Wilson. Some depth on the offensive line or in the back seven might have been more useful. 2. The Buccaneers take Arkansas Alabama safety Mark Barron seventh overall. Barron was one of the hottest prospects in the league on draft day, with both the Bills and Cowboys heavily linked to the former Razorbacks Crimson Tide ball hawk. He eventually landed in Tampa Bay, which has endured years of poor play at safety from the likes of Sabby Piscitelli. So this move makes sense, right? Well, hold your horses. While the Giants did just win a Super Bowl with two first-round picks at safety, it’s considered to be one of the least valuable and easiest-to-stock positions in all of football. And when teams have gone out of their way to grab safeties in the first 10 picks over the past decade, they really haven’t gotten what they bargained for. Sure, Sean Taylor showed flashes of brilliance before his untimely death, and Eric Berry eventually emerged as a key defender for the Chiefs during his rookie season. Those are the success stories. On the other hand, the likes of LaRon Landry, Michael Huff, and Donte Whitner really haven’t delivered on their lofty draft status. The game’s truly dominant safeties — namely Ed Reed and Troy Polamalu — lasted until much later in the first round before coming off the board. 3. The Chiefs draft Memphis nose tackle Dontari Poe with the 11th selection. In New England, Scott Pioli and Bill Belichick built their team around their first-rounders on the defensive line: Warren, Richard Seymour, and Vince Wilfork. Pioli’s tried that in Kansas City, but it hasn’t gone so well. He inherited one former LSU star defensive tackle (Glenn Dorsey) and drafted a second one with the third overall pick in the 2009 draft (Tyson Jackson) and moved them both from the 4-3 into a 3-4 alignment. Neither has developed into very much. And now, well, Pioli’s tried to solve the Chiefs’ perpetual hole between those two guys at nose tackle by going after one of the draft’s most polarizing players. Dontari Poe wasn’t even impressive enough in college to get past the All-Conference USA second team, but because he put on a freakish workout at the Combine and has otherworldly athleticism, the Chiefs took a guy with a fifth-round performance record in the first round. Maybe it’ll work. But this is now the third time that the Chiefs have grabbed a 4-3 defensive lineman and tried to develop him into a 3-4 run-plugger, and they’re currently 0-for-2. 4. Cleveland nabs Brandon Weeden with the 22nd overall selection. Over the past month, Brandon Weeden and his representation have done a great job of trying to turn his age (28, thanks to five years as a minor league baseball player) from a negative into a positive. He’s experienced! He has a good head on his shoulders! He’s ready to contribute now! Well, all those things better be true, because Weeden is on a totally different timeline from every other rookie. The problem with drafting a guy at 28 is that no college quarterback is truly ready for the NFL. Even the best quarterbacks in football go through a development process while adjusting to the speed of the game and the range of professional defenders. Weeden, who started for only two years at Oklahoma State, will be going through that development at ages 28 and 29. Guys who have followed a similar path — think Chris Weinke, Drew Henson, and Chad Hutchinson — have failed to ever develop into viable professional starters. Nobody wants to try to develop a 28-year-old quarterback, because by the time he’s done developing, he’ll already be 30 and declining athletically. And if Weeden struggles, well, the Browns don’t have the time to sit around and play a 29-year-old who isn’t up to the task. If Weeden succeeds as a pro quarterback, it will be a remarkable exception to what’s been a pretty sound rule: Don’t draft overage college players. 5. The Dolphins acquire Ryan Tannehill with the eighth overall pick. And in the long run, everyone who played quarterback musical chairs ended up getting a quarterback. The Browns and Dolphins appeared to be left out, but they both used first-round picks on Thursday night to overdraft players in the hopes of finding their franchise guy. They didn’t. Tannehill has an NFL arm and prototypical size, but he hasn’t exhibited NFL-caliber accuracy and didn’t get nearly the number of college reps he needed to step right in at the professional level. New Dolphins coach Joe Philbin might be able to mold him into a viable starter, but that’s not going to happen in 2012, which makes Miami owner Stephen Ross’s obsession with acquiring an exciting talent to sell tickets utterly ridiculous. Nobody’s going to buy season tickets in Miami to see Ryan Tannehill hold a clipboard all season. Miami could have drafted DeCastro or Luke Kuechly and upgraded a lacking part of their lineup; instead, they used the eighth overall pick on a lottery ticket.